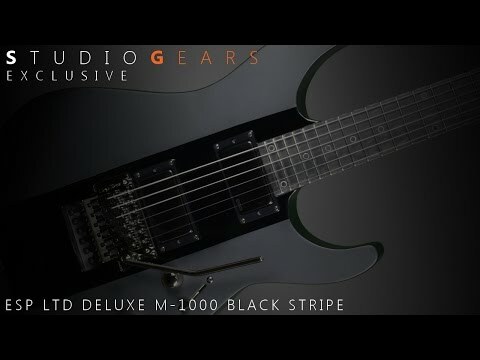 This LTD Deluxe M-1000 guitar in Satin Black with gloss black stripe is Studio Gears exclusive model. This awesome looking guitar also packed with features include: glow in the dark side dots so you can see better on the dark stage, white Pearloid hollow dots on fretboard, glossy ebony fretboard to match with that glossy middle strip and also ease of playing, EMG 81/81 with black chrome cover to (again) match with that glossy middle stripe. Awesome look and functionality, order yours today! The ESP LTD Deluxe M-1000 guitar in Satin Black with gloss black stripe. This awesome looking guitar also packed with features include: glow in the dark side dots so you can see better on the dark stage, white Pearloid hollow dots on fretboard, glossy ebony fretboard to match with that glossy middle strip and also ease of playing, EMG 81/81 with black chrome cover to (again) match with that glossy middle stripe. Awesome look and functionality, order yours today!